So installed macOS Sierra on both of my Macs this weekend. This was the gold master developer release, it will be released to the public on 20 September 2016. First off being to unlock my Macs with my Apple Watch is super cool. So far it has worked every time without flaw and would recognize my watch as soon as the lock screen was opened. I have tried apps to do this in the past, but they just did not work most of the time. Another feature I like it the new Universal clipboard. So when I copy something on the Mac or iOS device the same thing is available on other devices for a limited period of time. I use the Copied app on macOS and iOS and this new feature won’t replace it, but it is rather convenient. By the way Copied on iOS has just gotten even better. The notes app on macOS/iOS is more and more actually useful You can set the font size on the macOS version. One of those “finally” features. I keep most of my notes in plain text files on Dropbox, but Notes is good for storing images, PDF, and rich text notes across devices. This time around I “nuked and paved”, that is formatted my boot drive and installed a fresh version of Sierra from a USB drive. I probably didn’t need to do that, but hard to get rid of my MS Windows mindset – where it really is necessary. Still nothing like the smell of a fresh OS in the morning. Since my computer setup is highly modified with shortcut keys, ZSH shell, and lots of fiddly things – I keep a note containing all my settings, apps I use, and how to return everything back to the way I want it. I keep this list updated as I add new programs and this made the process of setting up two Macs fairly straight forward. Fortunately more programs now allow you to export settings or save their settings on iCloud. Still I also maintain a list of things to do before doing a new install as to what settings I need to export or programs I need to deauthorize first. Of course the most important thing to do is to do a full backup – which I did. I have a bootable backup created using Carbon Copy Cloner along with a disk image using the same program. Plus I maintain a Time Machine backup along with cloud service backup. Still since I keep so much in Dropbox and Onedrive – that is another layer of backup. Siri now being on macOS was a feature I didn’t expect to use much. Maybe it will turn out that way. Still I have found it very reliable in opening apps and since I use Apple Music it is highly useful to tell it what to play. There are additional Siri commands for working with the file system. You can also correct Siri using the keyboard. I would like being able to use a command line Siri where I could just type in the command in situations where I know dictation is unlikely to be accurate. Still the dictation has been very good using just the iMac built in microphone. I guess I will be learning to remember the Siri keyboard shortcut – holding down ⌘-space. As for app compatibility, but for one exception – every program I use runs fine under the new OS. The exception is Seil and Karibiner which I use to reassign the caps lock to be ⌃⇧⌘⌥ and to be able to create a hyper key for very unique shortcuts. Since these apps might not be updated in a while, I simply assigned my caps lock key to Ctrl and then found new keys to use to access most used shortcuts. No doubt I will run into bugs with macOS Sierra, but so far so good. Ever since I abandoned the 4-Volume set of the Liturgy of the Hours for mobile app versions I am still always on the prowl for newer apps and updates. The original entry in this field was iBreviary by Fr. Padrini. While good enough I was never happy with the daily update mechanism and the app itself has not been updated for a year and a half. 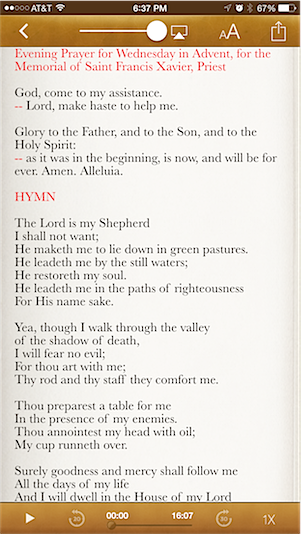 I had been interested in the Universalis app, but at almost $30 dollars at the time I stuck with iBreviary. This changed when I got the first iPad and Universalis was the only Liturgy of the Hours iPad app at the time. So for some years I have been fairly happy with Universalis as no daily text update is required. It was also superior since instead of just scrolling the text you turned pages which was much more convenient. It also had options such as what translation of the Psalms to use. My only annoyance with the app is that the text used is not the same text as in the official 4-Volume set and the selection of hymns is repetitive. On the plus side the app has been continually updated with changes made on phone software updates to match the user interface. Very well designed with some attention to detail. At $13.99 now it is still a solid choice and is available on iOS and Android. During my year using an Android phone I start looking at apps again and at the time the Divine Office app was semi-affordable and so I bought it. It was much like iBreviary as it used scrolling text and also used the official text. The daily experience was rather seamless where you are not concerned about downloading the texts for the day. It has a very unique feature in that in addition it has audio versions for all the hours. I mainly used this feature at times when driving and it was nice to hear a community of people singing the psalms along with professional recordings of the hymns. Still mainly I used Universalis for my daily reading and switching off to the Divine Office app for a change of pace or during octaves when Universalis got repetitive. The main reason I am writing this post is that recently they have released a new version of the app Divine Office 2. It is now a much better app and one that I will probably now use daily as they have really added some nice new features. The user interface is familiar as it follows the skeuomorphic design pattern of mimicking a physical book along with giving a patina of an old book. I think the design is a little overblown as I am preferring the more flat design pattern as in iOS7/8. What I like most is that on the iPad you now have regular pages that you turn instead of the continual scroll. I am not sure why they didn’t do this before since Apple has APIs to fairly easily access the same libraries as used in their iBooks app. Regardless it make the app easier to use. Unfortunately the iPhone version still scrolls the page. It has also been updated to fit the new larger iPhones. Playing back the audio versions of the various hours has been totally revamped. For example now you can change the playback speed along with skipping forward and back easily. While I did enjoy the audio versions the length of them could be quite lengthy at times. Adjusting the playback speed corrects this for me. Since this audio must be downloaded there is a setting for how many days you want downloaded at a time. A default of seven days which can be decreased or increased up to 21 days. This is important if you are on travel when you less likely to have access to a reliable WiFi connection. You can also select to have this download on WiFi only. Unfortunately it defaults to using both your cellular connection and WiFi. WiFi only should be the default and since this is buried in a setting some people might get a nasty surprise regarding their cellular download cap. Oh and just because I am rather picky app-wise I was also annoyed that the title of the apps as it appears on iOS is the same icon and title as the previous version. There are some other features for the Divine Office app that are more interesting than really useful. It has a status telling you how many people are praying the Divine Office using this app. Along with a turning globe that can be viewed showing around the world who is using this app. There is also a liturgical calendar. Still I would have preferred having the daily Mass readings like Universalis instead of the spinning globe. They also have sharing capabilities but it is rather crippled. Instead of using the iOS 8 share sheet it has a custom one that will only send a link to and About Today page via Facebook, Twitter, email, etc. Just not very useful. Plus there is no way to copy or highlight text displayed. I especially find that the Office of Readings sometimes contains something I want to copy for future reference. Universalis allows you to copy a column on a page, but not much else. For those who bought the original version there is an upgrade package where you can buy the new version for $4.99. Otherwise their pricing is currently five dollars off at $14.99. So overall I found this to be worthwhile upgrade and it is finely nice to have page turns with the official text. If you ever pray the Divine Office with others this is quite important. No doubt I will still be switching back and forth at times between Divine Office 2 and Universalis, but I just like the change off. I am still waiting for the perfect Liturgy of the Hours app, well perfect for my use. Until then still we have some good choices. I don’t know what the status is for an Android version of Divine Office 2 since there is no new information on their page and the original app does not include the new changes. The Android version for the tablet like many Android tablet apps is just scaled up without putting the larger form factor to use. If you blog, write notes, write articles or books, or any form of writing with formatted text you might want to consider using Markdown. Markdown is a plain text formatting syntax that allows you to write in an text editor and then have it converted to valid XHTML (or HTML). What this means is that you can write formatted text using any text editor and then via a software tool have it converted to an HTML document. As the use of Markdown has grown there are tools for converting it to many other forms including PDF. One source document can be converted to multiple formats. I use Markdown as part of my daily workflow to write notes, help documents, blog posts, and pretty much any writing workflow. The main reason I like Markdown is that I can write even heavily formatted documents in plain text and still have the plain text version be very readable. Often I don’t even convert these documents since I can easily read them as is. While I could certainly write them using HTML tags that really reduces the readability and it can quickly be difficult to read in plain text form. Once I have written a document in Markdown I can quickly convert it into the medium of choice. I use it to quickly create ebooks from Markdown documents along with converting online web pages into Markdown for reference later. To give you an example of how easy Markdown is to use, here are some examples. By using one or more Number signs # I can quickly write headers and use > to create blockquotes. This item is **bold** and this is using _italics_. But what I really love about Markdown is how I can insert links. Now it is easy to do inline links to create a link with the text you give it or a naked link like using angle brackets. This is fairly readable, much better than <a href=“http://www.ewtn”>Some Site</a>, still I find reference links even better. With a reference link I can name a link and then put the actual URLs at the end of the document. This makes reading the plain text version much easier and you have alllk your links in one place and you don’t have to repeat them when using the same reference. Here is a link to [Some site][ewtn] along with a link to [Catholic Answers][catholic]. Plus here is a link to [my blog][jester] and another link to to [Catholic Answers][catholic]. Here is a link to Some site along with a link to Catholic Answers. Plus here is a link to my blog and another link to to Catholic Answers. Reference links make my life so much easier. When I post the Weekly Francis I write it in Markdown and I have all the URLs listed at the bottom of my document for both readability and be be able so easily spot malformed URLs. Images can also be inserted via inline or reference links. Now this post is not intended to be a full Markdown tutorial. Just one to show you the simplicity and power of Markdown and why it might be something you could use. Since Markdown was originally released a decade ago the syntax has remained stable. Still there are other flavors that have added onto the original Markdown standard such as MultiMarkdown and a new standardization format called CommonMark. While all these variants support the original syntax they also add support for other features such as tables and more advanced formatting features. You can also use straight HTML format in Markdown documents along with Markdown syntax. So once you have written a document using Markdown syntax you might wonder just exactly how you convert it to XHTML or other format. There are a growing number of editors that allow you to write in Markdown and preview it live and then convert it. On Mac OSX I happen to use Marked 2 app because it is super-powerful allowing me to use any text editor I want and get a live preview of the document along with ability to convert into multiple formats. If you come to like Markdown and have a Mac Marked 2 at $13.99 on the Mac App Store is worth every penny. While you can use any text editor to create these documents it can be useful to use an editor specifically created using Markdown more like a traditional word processor. Here are some suggestions. Not an exhaustive list by any means as this is a growing field. MacDown – A free an open source version for the Mac. MultiMarkdown Composer A paid app, bu they have a demo version. Marked 2 which I previously mentioned. Ulysses III a writer’s tool for long-form documents including novels which can be used with Markdown and other markup languages. MarkdownPad. This is the only one I have used on the Windows side and it has a free and a pro version. No experience regarding Markdown editors on Linux, but they are available. If you have suggestions let me know. Scriviner 2 Another professional app for writers that is very powerful and can use Markdown syntax. Lots of management features if you are writing anything from a research paper to the Great American Novel. HastyScribe A command line program to convert Markdown Documents to self-contained HTML pages. Sublime Text 3: Powerful text editor that has packages supporting Markdown. $70. Atom.IO: A free open source text editor with both support for Markdown formatting and previewing. Also very powerful and similar to Sublime Text 3 and created by GitHub. In addition many websites already allow the use of Markdown such as reddit, wordpress.com, and Squarespace along with countless sites used by programmers such as StackOverflow and GitHub. The amazing thing about Markdown is that I could write this post in plain text and have no problem viewing it as plain text. I will use Marked 2 to create the HTML which I will paste into my WordPress blog. I keep this original post in a plain text document which I store in Dropbox. I wrote this in Sublime Text 3 which is my text editor of choice. MDwiki: Create a Wiki site using Markdown using a single document to launch it. Jekyll: A framework for creating websites and blogs using Markdown and generating a static website. I love to read and mostly I have transitioned over almost totally to ebooks. That transition started four years ago with the introduction of the original iPad in April of 2010. At the start the apps for reading ebooks was rather limited with only basic features. The original version of iBooks was pretty good and the notes and highlighting features worked from the start. The introduction of the Kindle app opened up reading books from the Amazon store. Still as time went on I wished for more powerful features. One of the positive features of eBook readers is being able to quickly highlight text for later along with attaching notes. In both iBooks and the Kindle apps there were some mechanisms for seeing these notes/highlights outside of the app. The feature I wanted most was to be able to copy my notes/highlights to a text file for easy access and search outside of an app. With the iBooks app you could see all notes/highlights for a specific book but couldn’t easily share the whole set. Now that OSX also has an iBooks app, it is a bit easier to access/copy these notes. If you import a book into your library this all works the same way. Amazon allows you to view all your notes via a web page. This works fairly well and you can even navigate to location in the book referenced. Unfortunately if you import a book into your Kindle library not purchased from Amazon, no notes/highlights will show up. So I started looking around for an eBook reader that would better fulfill my requirements. Specifically I wanted to be able to export all notes/highlights in plain text for reference. I did not want to be tied down to any proprietary system where I could loose access to these notes. Send highlights and notes. A HTML and a comma-separated values (CSV) version are attached to the email that is sent. The body of the email also includes title information. Send vocabulary (any words you wanted defined while reading). You can choose to send any vocabulary words for the selected book or any vocabulary words from any book you read via this app. Format is also HTML along with CSV. Export annotations (all highlights/notes/bookmarks/vocabulary). This sends an .mrv file which can be imported back into Marvin at a later date or shared with somebody who has the same book and the Marvin app. These features alone sold my on the app. The fact that this app is constantly updated and well maintained adds to the joy of using it. The interface is aesthetically pleasing without getting in the way. As with most third-part eReaders the books you read must not have Digital Rights Management (DRM) which is copy protection added to many books. There is little movement towards publishers releasing books without DRM, but some publisher do. For books on Amazon it will note whether the book has DRM or not. Ignatius Press does release there books without DRM. Sites such as Project Gutenberg have books in the public domain that can be used along with other sites. For the more adventurous it is relatively easy to remove DRM from books you have bought. Since I have a number of ebooks I use the open source and multi-platform application called Calibre to manage my library. Besides providing a central location to manage ebooks it will also convert from one format to another along with a wealth of other features. I keep my Calibre library stored on Dropbox since this provides both backup and can be accessed from iOS/Android apps. To read my books from my library in Marvin I can import them directly from Dropbox or I could use the Calibre connector. What I found unique about Marvin is that when I select from Dropbox it lists recently added files first. 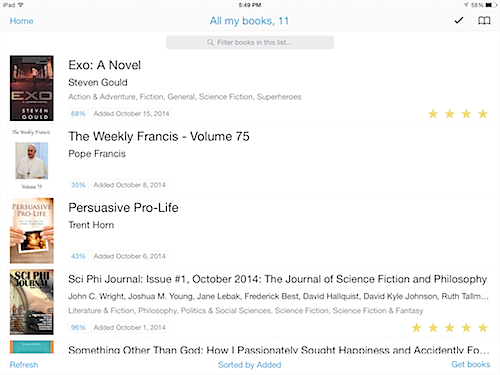 This makes it very easy to find recently added books regardless of where they are stored in Dropbox. It is very easy to manage the local library on your device to both add content and to just swipe to delete. You also have access to themes to change out the UI. As for the main reading environment you have all the features of other eReaders such as font size and foreground/background color. But a wealth of other elements to tweak are also available such as margin width, line spacing, paragraph indent etc. Along with setting your preferred gestures to navigate from page to page. The wealth of features can be a bit overwhelming. A rather unique feature is called Deepview which searches the book for characters and often used terms and then lists them by number of uses. From this view you can also quickly connect to an authors Wikipedia page or other articles about them. You can even create your own summary quickly including what is found in Deepview. Book syncing is provided via Dropbox. So it is quite easy to continue reading the same book going from an iPad to an iPhone and I found this worked well in practice. Marvin is now a universal app for both the iPad/iPhone. In the past they were separate apps. Searching for text in a book works well and I only mention this because I have not found this true for all eReader apps. The app even includes a timer so you can be reminded to stop, although not a feature I use. More importantly it does tell me how many pages are left in the chapter so I know if I can squeak in some more reading before finally quitting for the night. I really love this app and it just keeps getting better. Now for those who are on Android there are two apps I have used that I could recommend. They are not as good as Marvin, but have their own strengths. Moon+ Reader Pro – You can import books from Dropbox or Google Drive in multiple formats including PDF. You can also use Text-To-Speech (TTS) and switch between reading and using any voices available on your device. This worked, but I found it buggy, which is why I found a different app to use. Montano Reader – Fairly advanced with many features. For Android this was my preferred reader. Sync though is a paid feature requiring a subscription. TTS worked very well here and I could easily switch between reading and listening. 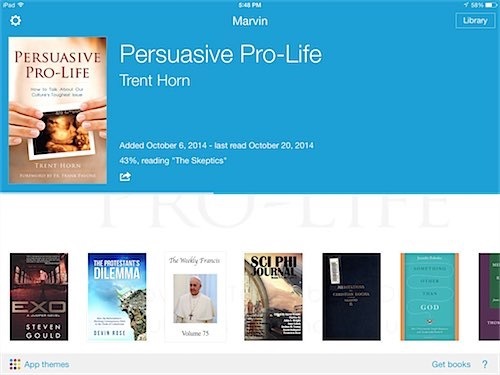 Marvin is geared towards EPUB formatted books and that is my format of choice. 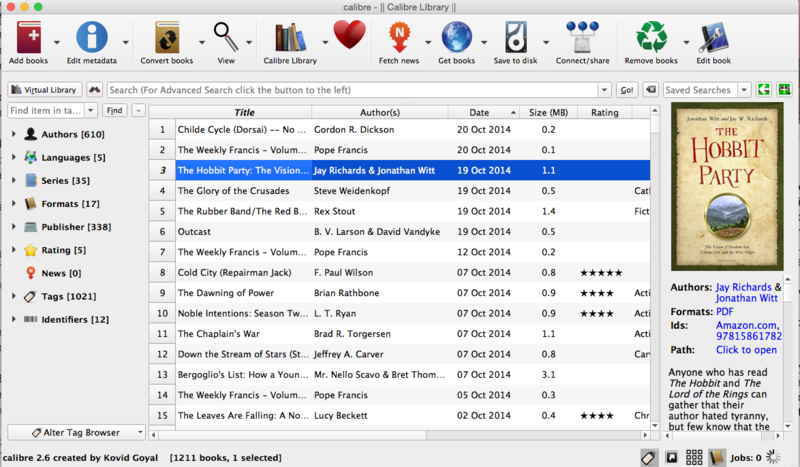 I use Calibre]calibre to convert Kindle books to EPUB. What Marvin can not handle is PDF documents. For PDF I use an app called Goodreader which is also only for iOS. Goodreader is also very powerful also allowing you to note/highlight and export this information out. It also works with multiple cloud services such as Dropbox and make reading PDF’s almost a delight. You can visually crop a document to get rid of excessive margin whitespace making it more readable. Marvin and Goodreader together pretty address all my reading needs. 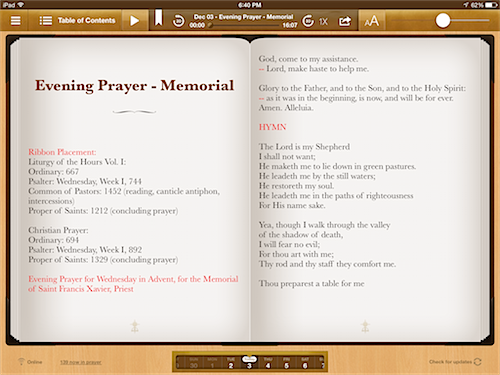 While I was on vacation I was asked to review an an iPad app called “Mass Explained”, with the full title being “The Mass Explained Volume 1: The Introductory Rites & The Liturgy of the Word.” My initial thoughts before getting a chance to download it was that it would be just another Catholic app with some good content, but nothing to rave about. So I was pleasantly surprised that it is indeed something to rave about. When I saw that the introduction was by Mike Aquilina I knew that I was going to find solid content. If the majority of the contents of this app had just been printed as an ebook it would have been worthwhile, but maybe not very engaging. I was really stunned by how good the layout is along with all the graphic media found on every page. This is a very beautiful app that is fairly simple to navigate. Swipe horizontally to navigate to chapters and other major sections and swipe vertically to page down through it. I would go more deeply into reviewing it, but recently Thomas L. McDonald did a comprehensive review that should be read instead. As an application developer myself looking at this app just from a technical perspective I find this to be a stunning achievement. It combines the best of the old school textbook layout with elements that can only be achieved in an electronic text book such as information in the side bar or other places that can be scrolled through. As someone who works in the field of creating courseware content creation tools along with other training applications again I am extremely impressed with this app. So what is the Latin for “Let it be published on the App store”? Regardless this app carries both the Nihil Obstat and Imprimatur along with being reviewed by ICEL and approved by the USCCB. To which I totally agree, but I would love to have this app seen and used by a larger audience. Dan Gonzalez is the developer and should be praised for what he has pulled off. iTunes link – App is for the iPad only. 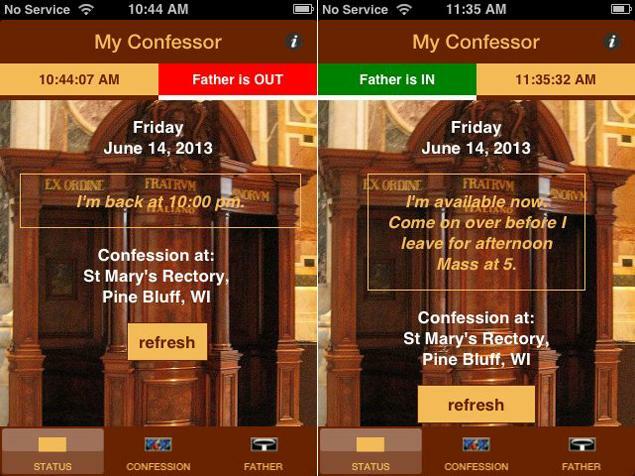 The My Confessor app lets busy Catholic priests update their statuses from their phones. Currently, the app is only available for users in the Madison, Wisc., area. Heilman sees this going national. God may be omnipresent — but His priests aren’t. So a holy man in Madison, Wisc., has turned to app development, along with divine guidance, to find a better way to tend to the needs of his 800-family flock. Father Richard Heilman is launching a My Confessor App that will let his parishioners know when and where he is available to listen to their sins. After 25 years in the ministry, Heilman believes Catholics could do with a bit more priest-and-me time. His preferred dosage is at least once a month. I think this is just so awesome. The idea is simple. A red status box means “Father is OUT.” A green status box means “Father is IN.” And priests have a special log in that lets them easily update their statuses and even post messages, according to app developer Mary Hoerr. The app also has a section explaining the sacrament of confession, as well as another place where users can read priests’ bios. Heilman is the only priest on the app for now and he’s been paying all the development costs out of his own pocket. But he says several other priests have reached out and asked to get involved. The app currently serves people in the Madison area. However, Heilman sees this going national. He envisions an app that has a Google map with markers that point out where the nearest priest is. So if you’re driving by and you realize that there’s a burden on your back that you need to unload, users of My Confessor will know exactly where to go. The app will be available to both iPhone and Android users later this month. For now, those interested can check myconfessor.org for updates. I hope this takes off as an idea. Confession is something that seems to be so deemphasized. Most parishes you find it available for roughly half-an-hour on Saturdays and of course by appointment. Neatly tucked out of site for most people and “reconciliation rooms” not located in the main part of the church makes it unlikely to see people going to confession. I like the service MassTimes.org to easily find a parish wherever I am, but it hardly has any information on confession times. I would just love to be able to have an app that let me know where I could go to confession based on location and time. So super kudos to Father Richard Heilman for not only making this app, but for making himself available to hear confessions. One of the problems I have with novenas is being able to remember to pray them during each of the nine days of if you are doing a novena of novenas during that time frame. So last Friday being a traditional day of starting a novena I remembered that I had recently seen an iOS app designed for novenas and so purchased it. Simply called Novena and priced at $2.99. There are many ways a mobile application could help with praying a novena as far as scheduling goes. Unfortunately this app came up with none of these ideas. No push notifications. No scheduling. Nothing to track what day of a novena you might be on. Neither was I impressed by the design of the app. Apparently not much effort went into design and it only worked in portrait mode in one orientation. Being a universal app for the iPhone and iPad it at least supported both platforms. Yet on the iPad the menu was apparently the same as for the iPhone or so just took up a small area at the top right part of the screen. On the plus side novenas were grouped in several ways that could be useful in finding the one you want. You could also favorite one to easily come back to later. The artwork seems to have been taken from German holy cards and I did like the look of these cards and they did give the look of the app some consistency. Once selecting a novena you were presented with the individual novena and you could select or swipe to a history of the saint involved. One nice feature was that for each image you could select Symbols to show a text overlay explaining some of the symbolic components in the image. Overall I was disappointed by this app for missing obvious features and having a poorly designed interface and menu. So if anyone knows of an iOS novena app with push notifications and/or some form of scheduling please let me know. I was going to do a review of the new and free Conclave app put out by Logos/Verbum that is now available for iOS and Android but Thomas L. McDonald already has a fine review. The Vatican web site has long frustrated me as evidenced by my parody post back in 2005. There are plenty of things that drive me crazy about it especially the navigation and the fact that instead of using CSS they use table formatting for documents. So I was a bit surprised to see shortly after the interregnum started to see a commemorative site for Pope Benedict XVI setup that for the most part was quite nice. They setup what looks like a physical book where you flip pages to see photographs with descriptive information that gives an overview of Pope Benedict XVI papacy. Now the fact that they did this using the metaphor of a book in this case works out pretty well. Not all cases of skeuomorphism in design are bad. Really skeuomorphism has been used considerably in Catholic art and architecture. I was quite surprised when I viewed this on my iPad that the flipping of pages was done via smooth full animation where the page curl followed your finger as in the iBooks app. The same effect can be used with a mouse or on a desktop browser you could just click on the edge to advance through the pages or via the keyboard. This commemorative “book” really is quite nice, although I haven’t made it through all the pages without tears threatening to well up. This would be quite awesome except for one thing. There was something odd about the design that I couldn’t quite put my finger on and Father Roderick pointed out exactly was wrong. The font used is Comic Sans. I am sure one of the anathemas for the Council of Trent was regarding Comic Sans, if not there should have been one. See Fr. Roderick’s meme graphic. Now if they removed the Comic Sans and made this as an actual ebook I would buy it in an instant.